A £450,000 scheme for two temporary stopping sites for travellers in Central Bedfordshire has cleared another hurdle. The council is responding to residents’ concerns about a lack of enforcement in dealing with gipsy and traveller-related issues. One of the temporary stopping sites will be in the north and one in the south, its sustainable communities overview and scrutiny committee heard. A gipsy and traveller unit is also being set up by the local authority. It will be funded from its community safety reserve at a cost of a further £500,000 for two years, with future costs managed through its financial planning process. Director of community services Marcel Coiffait said: “People won’t necessarily welcome these potential sites with open arms. “But the purpose of them is to take away another problem, which is unauthorised encampments. “Swapping that for a single regulated site is actually a benefit to those communities. “So we will be focusing our attention on those bits of Central Bedfordshire which suffer from unauthorised encampments. The local authority wants to “take a more proactive stance on a range of gipsy and traveller issues”, according to a report to councillors. It wants to work more closely with local communities and provide “a more efficient response to dealing with gipsy and traveller matters in Central Bedfordshire”. There are 38 permanent sites in Central Bedfordshire, as well as two which are council-owned and nine travelling showpeople sites. The council’s head of community safety, parking and programme Jeanette Keyte said: “Generally those sites don’t cause us any problems. “But you’ll be aware there are some sites which have more complex problems, which need more of an input from the council. “One of those particular projects is around Billington. “Challenges include breaches of planning permissions, absence of licensing, sub-letting, criminality, infrastructure and local community impact. “We’ve had more information than we’ve ever had before on those two particular sites in Billington. “There’s been a reduction in fly-tipping,” she added. “That’s not to say it’s stopped. “But, when it does happen, it’s a lot less and we are able to work with residents to get it sorted out relatively quickly. 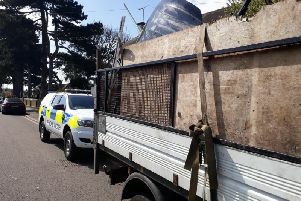 “We’ve issued abatement notices on some unsafe caravans, rehoused some tenants, we now undertake regular visits and we’ve begun enforcement work. “We’ve issued planning contravention notices, penalty charge notices, personal circumstance questionnaires and we’re currently drafting enforcement notices for the next step of that enforcement work. “Some of it is based around learning from Billington. We are less than a year in from the start of that work. She told the commitee: “The next option for us to improve our work on unauthorised encampments further is for temporary stopping sites in Central Bedfordshire. “These can be used for up to 28 days, deposit and rent taken,” she said. “If an unauthorised encampment is set up then we can ask them to move to a temporary stopping site. “If they refuse, the police can use their powers to remove them out of Central Bedfordshire for a period of three months. “We will take a report to executive to recruit for the gipsy and traveller unit, and for where these sites will be. “We are looking at one in the south and one in the north, in the south up to 35 caravans, and in the north up to 15. Conservative Dunstable Icknield councillor David McVicar, who chairs the committee, said: “We know it’s a problem. “It’s a thorny problem. And it’s not going to go away overnight. “But we are now moving in a far more positive direction than we have done in all the years I have been involved with gipsy and traveller incursions. Councillors agreed to recommend to the executive that the required funding should be included in the council’s medium-term financial plans.